Something so frivilous as a Fantasy Football Team doesn't, at first thought, seem to merit its own page on the Club website, but anything that lasts a decade and is more active than ever can't be all bad! ERFFL is probably the origin of our tongue-in-cheek motto: "E-town Rotary-- a gambling club with a service problem!" 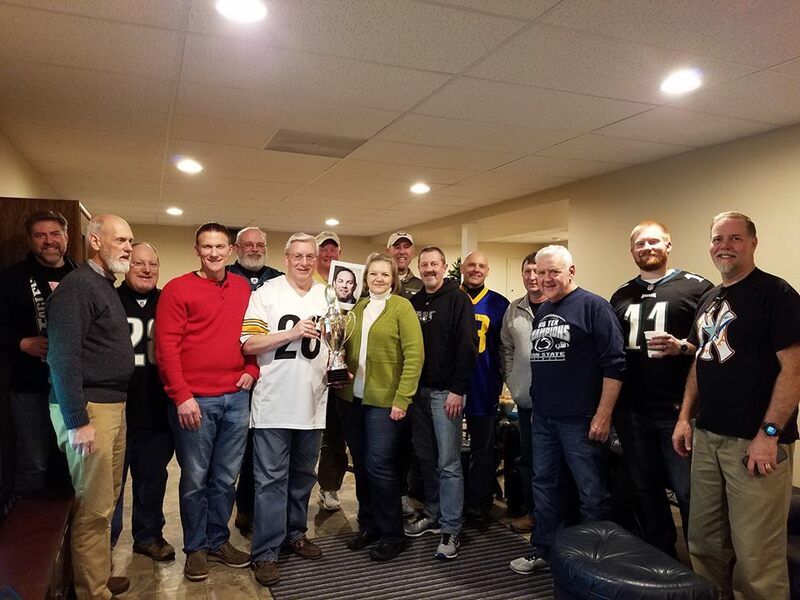 ERFFL members will pony up an annual team fee, study up for a live player draft each year, pay fines that benefit a club charity, support all the other "risky business" we concoct, and all in the name of Rotary Fun and Service! A telling fact-- of the 15 members who were winners in the past 18 years, all but 3 are still active with the club! Leadership has something to do with it, too, Joe Rebman was the Commissioner for 9 years, took two off with Dave Schmidt filling in, and now Joe is back. The league started small, continues to grow, and now with the addition of Monday meeting members, is at 24 teams in 2 conferences. This isn't a "good ol' boys" club-- ladies are welcome! If you are interested in getting involved in the 2018-2019 season, contact Commissioner Joe ... so he can put you on the "franchise acquisition" list. You can recap the past year at the 2017-2018 ERFFL Website! Oh, by the way, the season ending celebration party is a blast! Presentation of the 2017 Championship Trophy to Dennis Zubler. 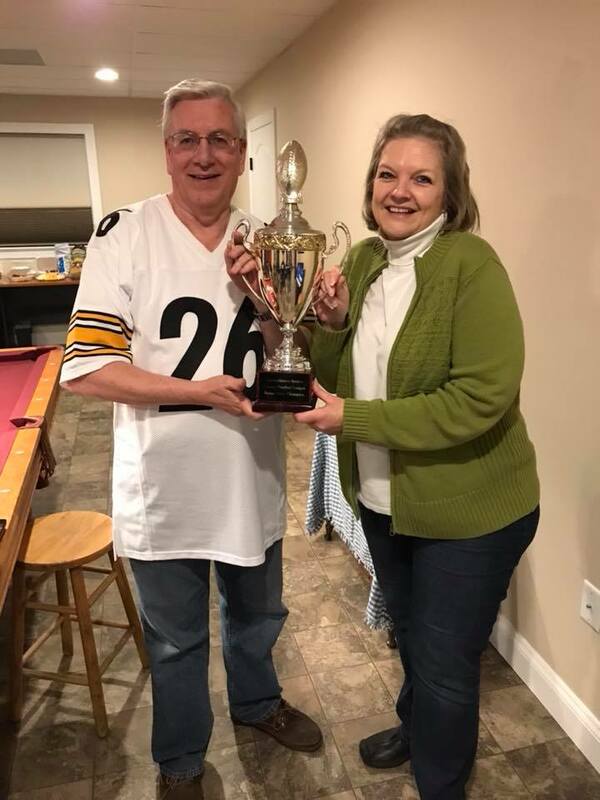 The 2015-2016 Champions Jae and Debbie Dupler receive the ERFFL Trophy from past Champion Kevin Engle....photobombed by Champ-wannabee Jeff Kline and observed by 17-year- without-a-championship owner Ken Wolfe. 2013 Champion Scott Cvek expressing his Trophy love as the trophy is presented by 2013 Champ Dan Brill. 2012 Champion Dan Brill receives the trophy from the 2009 Champion Jason Zubler.